Please use the following form for reporting issues while using OhioMeansJobs.com. Manage your future with this one-stop-shop for all things education and career oriented. From tracking assessments and job leads to researching employment programs and scholarships, the Backpack makes it easy to streamline your personal and professional goals to give you the edge you deserve. How To Post a Resume and Rate it. This document goes over how to post the two different types of resumes. Show off your experience, skills, and abilities by making your resume visible to employers. Keep your resume at the top of employer’s search results to maximize your chances of landing that next career opportunity. View opportunities locally, state-wide, or nationally by job title or keyword, or refine further by employer, skill level, education, salary, and more. Learn more about occupations of interest, including available opportunities by selected employers, activities to help you prepare for the occupation, events to network, and knowledge or training to fulfill the requirements of the job. Learn more about your hidden talents and interests with this interactive assessment designed to help pinpoint the best career to make you successful. Learn the surprising truth about what target salary you actually need to cover your monthly expenses while building your future. With over 1 million scholarships available for searching, obtaining the education you need or desire to advance in your career goes from a dream to a reality. Free virtual learning center to help you prepare for the academic and professional challenges you will face, from high school and college tests to successful career and business skills to citizenship prep and exams. Give yourself the competitive edge for success by staying aware of and being involved in the job fairs, workshops, and other events in your community. To find Labor Market Information for an occupation in OhioMeansJobs.com, click on the Occupational Search icon found on the home screen. The Occupational Search screen will appear. You can search by industry, education, keyword or salary. For our example today, we will click on the Industry drop-down and select Manufacturing. As you can see, the Manufacturing landing page appears. This page will show a definition of the industry, “fun facts” about it, and other information. If you click on Labor Market Information, you can learn about employment projections for manufacturing, the number of manufacturing business establishments in Ohio, the education needed for careers in manufacturing, average age of workers in manufacturing, and more. Each industry page has a Partners/Sponsors section to link you with companies or resources. Also from this page, you can view a snapshot of the industry. 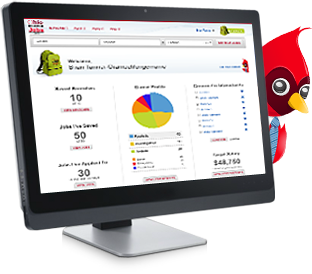 It will show you how many jobs were posted, the salary, education, certifications, and skills needed for the industry. It will also tell you the top employers and occupations with the most job ads. Now let’s go back to the industry landing page. Since manufacturing is a broad industry, let’s look at the Industry Careers to narrow down your interest. A list of occupations will appear, with in-demand occupations listed at the top. Ohio has identified in-demand occupations based on wage, projected number of openings, and expected industry growth. Let’s select electronic engineering technicians. At the top of the page you’ll see a description of the occupation. Underneath that are related occupations with similar job duties. The Work Activities section lists typical job duties performed by electronics engineering technicians. This page also shows employment trends, the outlook for the job, education and income information. We hope this information has been helpful. Remember to check back often and search as many occupations as you’d like. This information is updated frequently to help you find your first, next or better job! WorkKeys® is a registered trademark of ACT, Inc., which was not involved in the production of, and does not endorse, this product.